The sea buckthorn plantations along country roads add character to the landscape. 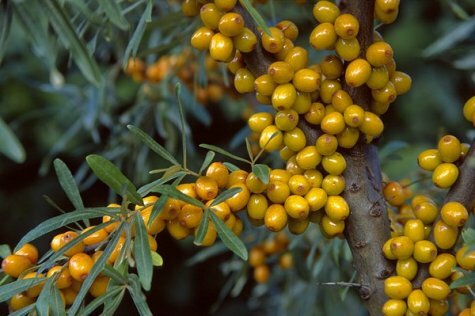 The sea buckthorn fruits, drupes, are oval-shaped, yellow to orange-red in colour. The fruits are attached by short stalks on to last year’s branches – strongly and tightly. They begin to ripen in mid-August. Harvesting is actually the most difficult task, it takes time and patience. And picking should not be delayed. The fruits will not drop from the shrubs but when over-ripe they get crushed between the picker’s fingers and lose their valuable properties. The shrubs begin to bear fruit when they are 3-4 years old and continue to do so so for as long. More than 10 kilos can be picked from a fully grown shrub . Birds prefer ripe berries and don’t compete with timely pickers.